There are lots of options for brining containers, some that are free, and some that will cost you a few bucks. Most of the time, free is the best way to go, but if you want a safe, effective brining vessel, it's worth spending a few bucks. What Type Of Containers Are Available For Brining Meats and Poultry? For free brining containers that work well with turkeys, five gallon food grade buckets work pretty well. Just go to some fast food restaurants and ask for an empty pickle bucket, and you'll surely get what you need. It will take some scrubbing, a soak with baking soda water, and airing out to get rid of the dill pickle smell, but once it's gone you have a great brining vessel. You can buy 5 gallon buckets, but if you do, be sure it's food grade plastic. Check restaurant supply stores, and other places that sell culinary supplies. If you are brining small stuff, like chicken pieces, or pork chops you can simply use a mixing bowl, or a large food storage container. The only requirement is that it's made of a "nonreactive" material. Nonreactive means that it's something that salt, sugar or acids won't react with, which would possibly cause off-flavors in the brining food. Non-reactive materials suitable for brining include food grade plastics, stainless steel and glass. Unacceptable for brining are aluminum and copper. The metal can leach into the brine, and affect the flavor of the meat. 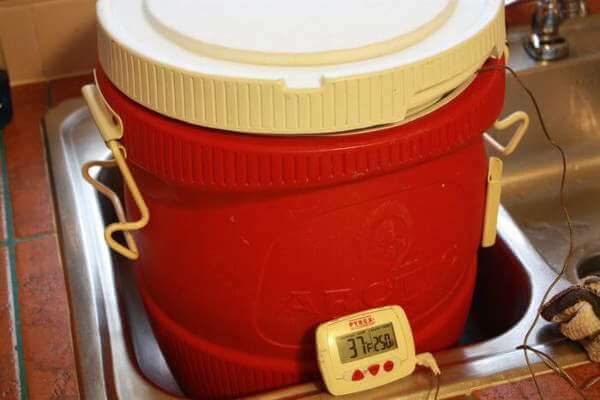 But whether you use a food grade bucket or a kitchen bowl or storage container, the brine and food has to remain cold. The best way is to put the container into the refrigerator. 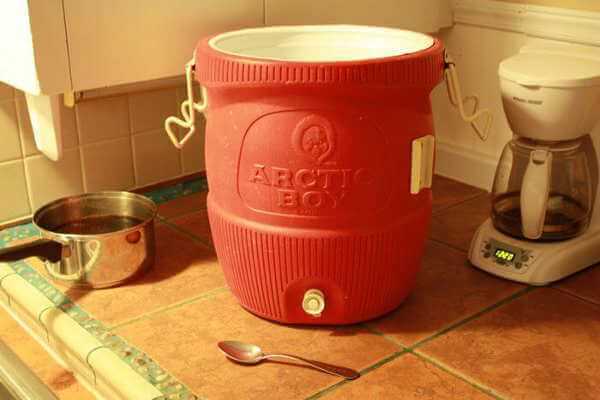 But does your fridge have room for an extra 5 gallon bucket? The Ultimate Type of Brining Container You Must Have! When I was much younger, the folks often took us kids out camping. We went to Taylor Reservoir in Colorado, the White River in Missouri, and even up to see Mt. Rushmore in South Dakota. We always had nice, cold water to drink, and got it by pushing the little button on the spigot that was near the bottom of the insulated water cooler we used. Fast forward 30 years or so…That insulated water cooler sits unused in the folks basement. I see it there a few weeks before Thanksgiving, a time when brining turkeys is on my mind, and it hits me. "That would make a great turkey brining container!" I ask for it, and it's mine. And I was right. I don't think there's a better container than an insulated water cooler like that one for brining turkeys. Being insulated, it holds the cold in very well. And its shape is perfect for turkeys. The inside diameter is almost large enough for a 12 pound turkey to lie flat on its back on the bottom. 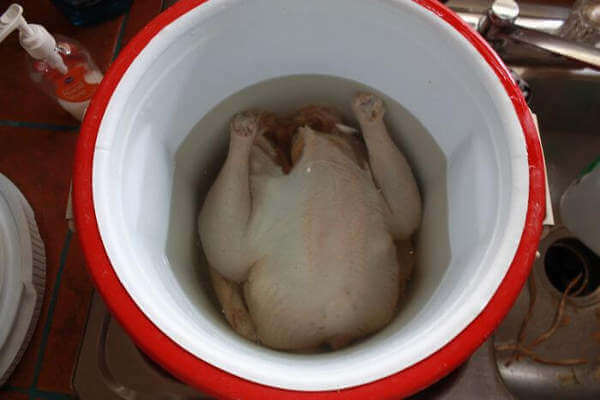 The tight fit means it takes a minimum amount of brine to completely submerge the turkey. Don't take any chances when preparing your turkey for the smoker. Read this important article from the USDA regarding safe poultry brining practices. I can brine a 12 pounder in 6 quarts of brine. And it stays cold, down to 40 or below, for almost 24 hours by just placing a frozen gallon milk jug of water in it, right on top of the turkey. The ice keeps the turkey and brine safely cold, and its weight holds the the turkey under the surface of the brine. In my opinion, one of the best things you can add to your turkey smoking arsenal is an insulated water cooler. If you're serious about brining turkeys, it's the way to go!